Person Street is home to several stately homes, but one in particular wasn’t always on Person Street. The Garland Tucker house at 414 N. Person Street once sat precisely one block west at 420 N. Blount Street. With all of the growth downtown over the past few years, there has been an increased interest in Raleigh’s older architecture — specifically what we’ve lost. Many times our own state government is responsible for the demise of once grand mansions and other historical landmarks. Be it for a shiny new office building or a parking lot, our architectural artifacts seem to pay the price for progress. 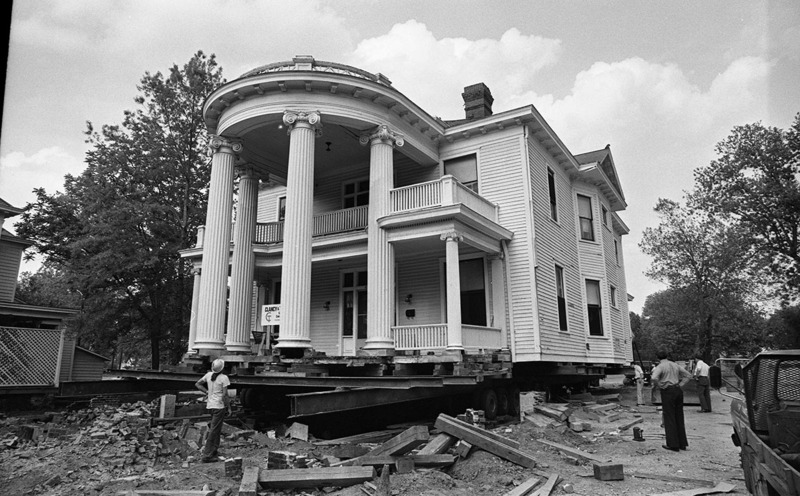 In 1960s Raleigh, demolition was not only common, but largely accepted. The Garland Tucker house, however, proved to be an exception. 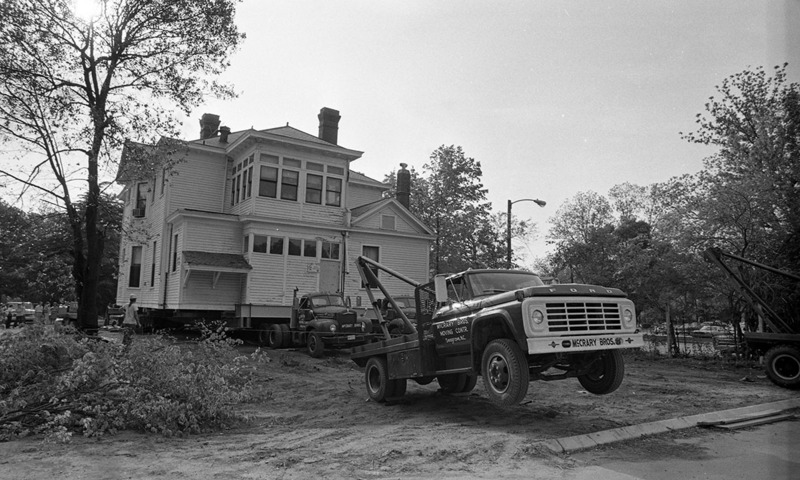 In 1975 the state of North Carolina bought the land the house sat on and Garland S. Tucker, Jr. donated the structure to the City of Raleigh. Shortly thereafter the city footed the bill to move it. Tow trucks pull the Garland Tucker House backward toward Person Street. Built in 1915, the Garland Tucker House is one of the few remaining examples of Neo-Classical architecture in our city. It has been designated a Raleigh Historic Landmark and is on the National Register of Historic Places. Today it currently operates as a meeting place for surrounding communities and can also be rented for private events. You can learn more about using or visiting the house here. Photos copyrighted by the Raleigh News and Observer. Illegal to use without express permission from the N&O. I used to drive into town from the east on a side street, not New Bern Ave. There was a lovely red brick home on the north side of the street, maybe Jones St. It had a white portico like this one, with white shutters. It looked straight out of Savannah, or Charleston. I googled the area, saw no rounded porticos in the appropriate area. Anyone know about this stately home? Is it hopefully still with us? Am I having a Senior Moment? Great photos, Ian! Thank you for finding and sharing!